We’ve had some nice warm weather in Washington this week, which has pumped up the bike commuter scene, if only a little. Today I saw one rider going to work in regular summer wear, bike shorts and short sleeve jersey. 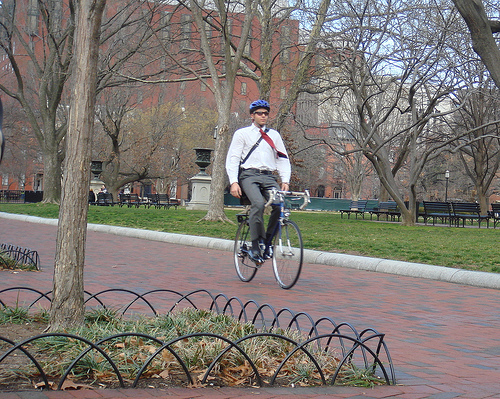 Over in Lafayette Park, across from the White House, riders were going to and fro without their usual heavy jackets and full gloves. Full Size photos of these and all TDR pictures can be found at my Flickr page. 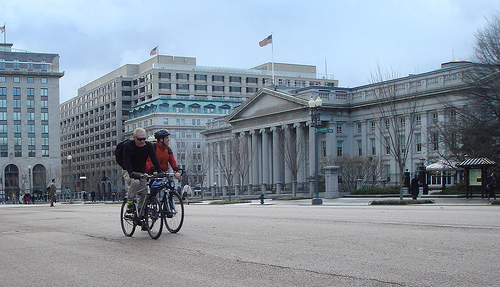 Washington is a great year-round cycling city, but even more so during our periodic January warmups. Nice weather down here as well. Will I see you Saturday Ed?